According to The Economist, weather-related natural disasters are occurring more frequently in the 21st century. Recently, it has seemed impossible to go more than a few weeks without hearing about a new and devastating hurricane, earthquake, landslide, or other horrifying disaster. While more people are being affected by these disasters, the number of fatalities is actually declining as our responses to them improve. 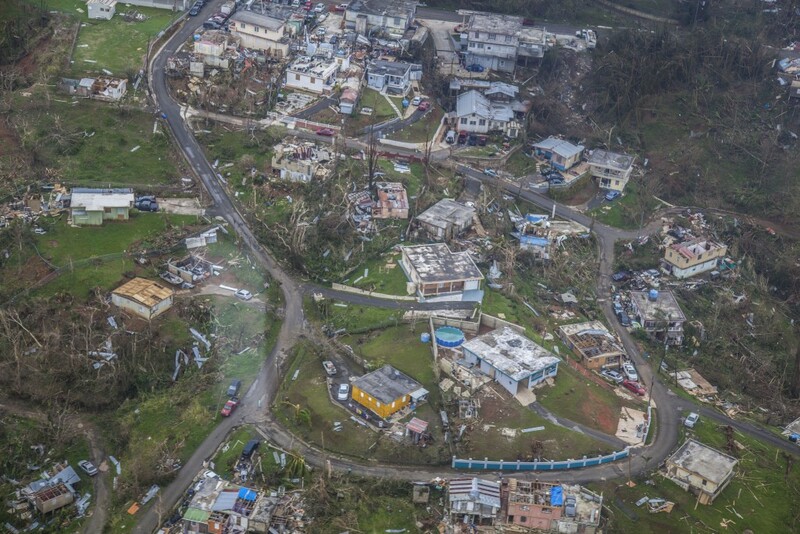 A photo of damage caused by Hurricane Maria taken on 24 September 2017 by the US Customs and Border Protection Agency, as they surveyed the impact of the storm on Puerto Rico, USA. Qatar Computing Research Institute (QCRI), established by Qatar Foundation in 2010, works directly with relief organizations around the world to develop the technologies they need to make sense of “big data” during a disaster. Through this collaboration, QCRI has developed a world-leading, life-saving technology dubbed ‘Artificial Intelligence for Disaster Response’ (AIDR). While we are far from the ability to prevent natural disasters, AIDR uses innovations in big data to facilitate increasingly rapid and more efficient responses to these disasters. With time, it may even give us the ability to predict where relief should be sent before an emergency strikes — saving countless lives. Today, during a natural disaster, the challenge for first responders is not necessarily a lack of information about what has taken place. On the contrary, sorting through a massive flow of information available through social media without an ability to verify and prioritize can paralyze relief response efforts. AIDR turns this data into an invaluable asset. At QCRI, we have combined human computing with artificial intelligence to automatically identify relevant information from a massive volume of tweets and text messages. On its own, a 140-character tweet may seem like it contains little information of use in a disaster situation. However, with the help of artificial intelligence, tweets can be use collectively to generate a profile of the areas affected by a disaster, estimate causality numbers, and predict demand for certain resources. Consider the example of Nepal. Following the 7.8 magnitude earthquake that devastated the country in 2015, QCRI partnered with the UN Office of Coordination for Humanitarian Affairs to facilitate information sharing, collecting enormous amounts of high-resolution fly-over video streams from drones. Our technology allowed relief organisations to filter through hundreds of thousands of tweets using the hashtags #NepalEarthquake and #NepalEarthquakeResponse to assess damage and pinpoint the areas in need of immediate attention with just the click of the mouse. A map of geo-tagged tweets from Houston, Texas, USA, indicating the damage caused by Hurricane Harvey and other related reports. Similarly, during 2017’s Hurricane Harvey in Texas, QCRI’s robots collected more than 4 million tweets to identify 90,000 unique image URLs from the disaster areas that were deemed useful for humanitarian response efforts. AIDR employed state-of-the-art “deep learning techniques” to automatically classify both textual and imagery content collected from Twitter. This included a tool to assess damage-level and classify the level of damage into three categories: SEVERE damage, MILD damage, and NO damage. This became extremely useful to overcome information overload issues and help decision-makers process large amounts of data in a timely manner. You can see the full map of geo-tagged tweets analyzed during and after Hurricane Harvey here. In the case of Hurricane Maria, which devastated large parts of the Caribbean in September 2017, AIDR was tasked with aiding the disaster response, collecting more than 2 million tweets related to the storm. Manual analysis of these messages can be a hectic and time-consuming task for crisis responders, especially during an ongoing disaster. To overcome this issue, QCRI’s work on “Interactive Monitoring of Critical Situational Information on Social Media”provides an interactive dashboard to help manage and sift through the overload of information. 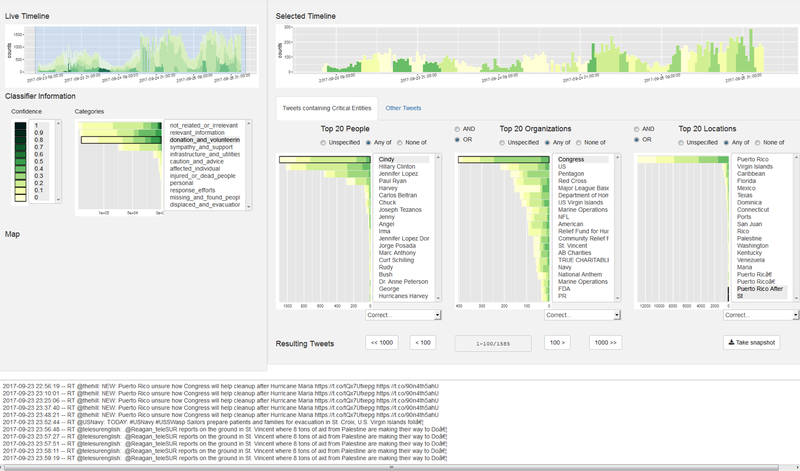 This image shows the interactive dashboard and its different visual components, including timelines (top), machine classifiers (left), top critical entities (people, organizations, locations), and tweets view (bottom). In addition to natural disasters, QCRI’s humanitarian technologies are directly applicable to a wide range of other social good initiatives, ranging from wildlife protection and election monitoring to building resilient societies. If trends continue, natural disasters could continue to become more frequent and severe with the changing climate. Technology experts predict that the tech community will rise to the occasion. While damage to the climate may be difficult to stop without drastic action, at QCRI we are already working to limit its human impact. We already partnered with local first responders, such as those in Suffolk County, New York. With more partnerships like this, we will continue to refine AIDR’s predictive capabilities and help authorities respond more effectively to disasters the world over.